I was just blind tasted and semi-quizzed on a few wines by a buddy of mine at the shop where I work. Imagine my surprise when after using up all five of my guesses (South Africa, South America, Paso Robles, Australia, and Canada) what he revealed??? 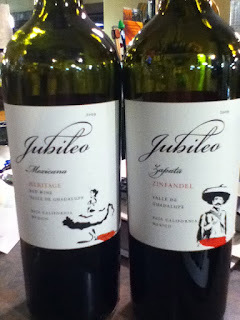 Yeah, well you already read the title of the post....wines from our buddies down in Mexico. I don't actually know why I'm so blown away by the high quality of these wines. I mean, Mexico has been providing a large part of our really good quality produce here in the South West for decades or longer. Hell, California used to be part of Mexico. The Guadalupe valley owes much of its success to a small group of Russian pacifists who touched down in the region in 1905 with Zinfandel cuttings in hand. This 400 case bottling was created from a small parcel of old vine, dry farmed Zinfandel vines owned by Baja's famed Bibyoff family. On the nose I get aromas of wild raspberry, white pepper, and just a touch of earth and oak. It's smells like so many of the Zin's I've had from Paso Robles and has this super-ripe fruit aroma. On the North side of Mexico's Guadalupe Valley the vines for this wine thrive due to intense summer heat, cool nights, and comparatively lower water table. It's a typical meritage blend of 68% Cabernet Sauvignon, 21% Merlot, and 11% Cabernet Franc. The wine is aged for 10 months in new French oak. On the nose I get aromas of red raspberry, cherry, herbs, hints of pepper, earth, and a touch of creamy oak. The Merlot and Cab Franc are very expressive on the bouquet.